Permeability varies from 1,450 to less than 0.1 md (Dutton, 1982a). "Vertical permeability in the lower Permian and Pennsylvanian strata is assumed to be two orders of magnitude lower than horizontal permeability" because of extensive horizontal stratification. 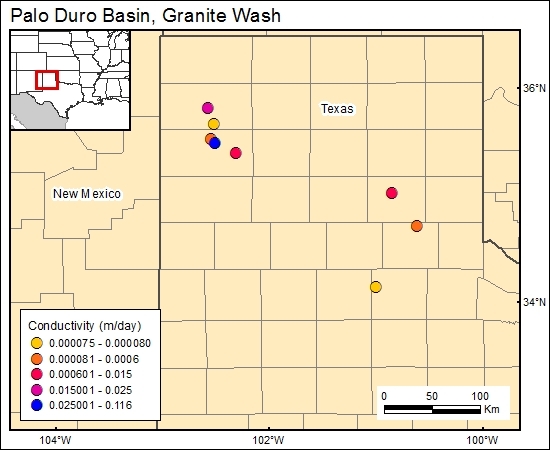 "Proximal granite-wash deposits near the Amarillo Uplift and Bravo Dome apparently have higher permeabilities than distal granite-wash deposits near the center of the basin." (Senger, and others, 1987, p. 10). There was only one Granite Wash well in the SLERO Oil Information data base (Holtz, 1997), and this well was located in the Anadarko Basin but had no permeability data. Dutton, S. P., 1982a, Depositional history and reservoir quality of Granite Wash, in Gustavson, T. C., Bassett, R. L., Budnik, R., Finley, R., Goldstein, A. G., McGowen, J. H., Roedder, E., Ruppel, S. C., Baumgardner, R. W., Jr., Bentley, M. E., Dutton, S. P., Fogg, G. E., Hovorka, S. D., McGookey, D. A., Ramondetta, P. J., Simpkins, W. W., Smith, D., Smith, D. A., Duncan, E. A., Griffin, J. A., Merritt, R. M., and Naiman, E. R., Geology and geohydrology of the Palo Duro Basin, Texas Panhandle: a report on the progress of the nuclear waste isolation feasibility studies, 1981: The University of Texas at Austin, Bureau of Economic Geology, Geological Circular 82-7, p. 87–90.